Following the previous Skudai Wonton Noodle review by Jolly Ben, today we are going to the famous Skudai Duck Mee (士古来鴨肉). This is the name that is harmoniously adhered to the city Johor Bahru in Malaysia whenever good food or famous food is mentioned. Today Jolly Ben is bringing you some pictures and review for the famous Skudai Duck Mee. The Skudai Duck Me is situated near the side of the main road of Jalan Skudai. The picture below is the crowd at Saturday morning about 11:30am, if you wait till lunch time around 1-2pm, the whole place would be very packed and the waiting time for the food to come would be at least 20mins. So choose your timing wisely. Our yummy Skudai duck mee was served in less than 5 minutes. Here's a rundown of what we ordered..
All the food we ordered above are in single serving because when you add up so many different things we ordered, it is good enough for 2 pax. The bowl of soup comes together with every order of duck mee as a default, you do no need to mention it. First up, let's introduce the duck noodles. 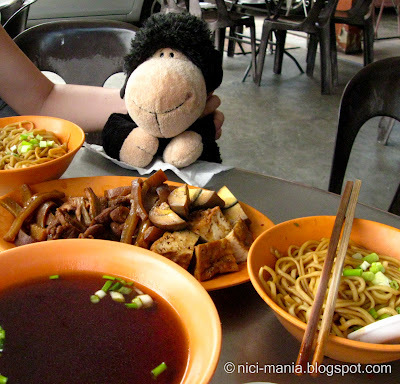 There is a choice of plain white rice or kuay teow (ricecake strips) to choose from but Skudai Duck Mee is famous for its mee, i.e. the noodles, they are drenched in their braised duck sauce with chopped spring onions for toppings. We move on to the main highlight of Skudai Duck Mee - the duck meat. However, the duck meat here to be frank is nothing spectacular, it is dry and not flavorful. You can find much better braised duck meat elsewhere. So what makes the skudai duck mee so famous since the duck meat is not even tasty? The answer is this braised duck gravy. This legendary braised duck gravy has been used for cooking the duck meat for 37 years already! I'm sure you know how braised meat or meat stew always taste better the second day, so imagine how good this sauce at skudai duck mee taste after 37 years. The specialty we want to introduce here is the braised pig intestines. They only serve one kind of pig intestine here at skudai duck mee, which is the large intestine but notice how the large intestine in our picture look smaller than usual? The reason is you can specifically order the end part of the large intestine, because we love to eat small intestines which has a more crunchy bite so the end part of the large intestine is actually a lot like the small intestine. The pig intestine here is actually more tasty than the featured duck meat, it absorbs the 37 years duck gravy much better, so this is a must order here! The braised pork skin although deters many women, absorbs the 37 years duck gravy best and it has all the collagen you need for a youthful skin. This Skudai Duck Mee shop is so famous that 2 other imitation shop opened at the opposite selling the same food. Unknowing tourist might get confused and end up in the wrong shop or those who don't want to wait might opt for the imitation duck mee. Unfortunately, we have tried the one right opposite and it is nowhere as delicious as the original skudai duck mee, so make sure you recognize the correct shop. Rated solely for the 37 year duck gravy and pig intestines. The duck meat is not really good and the attitude of their service is very bad. No matter when you eat there, you will get served with a face like you owe them money. The food is quite expensive too, total damage was RM18 for what we ordered above. Address: 29，Jalan Emas Putih Dua, Taman Sri Skudai, 81300 Johor Bahru, Malaysia. I agree with Jerry and Ben, when I read your posts I always feel hungry right after!